At one time I was so sick I could barely move. Needless to say, housework fell by the wayside. What little that got done was done by my husband and children. I watched this all from the couch, where I spent most of my days. So I totally get that chronic pain and housework don’t go well together. The trick I’ve learned, is to do what you can, a little at a time, and don’t get discouraged. There’s no disputing that it’s going to be more difficult getting things done, if you suffer from chronic pain. Along with this generally comes stiffness. For myself, I noticed that it took me infinitely longer to do very simple tasks, like walking across the room. I had to overcome feelings of worthlessness, since I was unable to do much. I resorted to praying. At least I was doing something that could possibly make a difference. Actually, prayer is what helped me through one of the darkest times in my life. 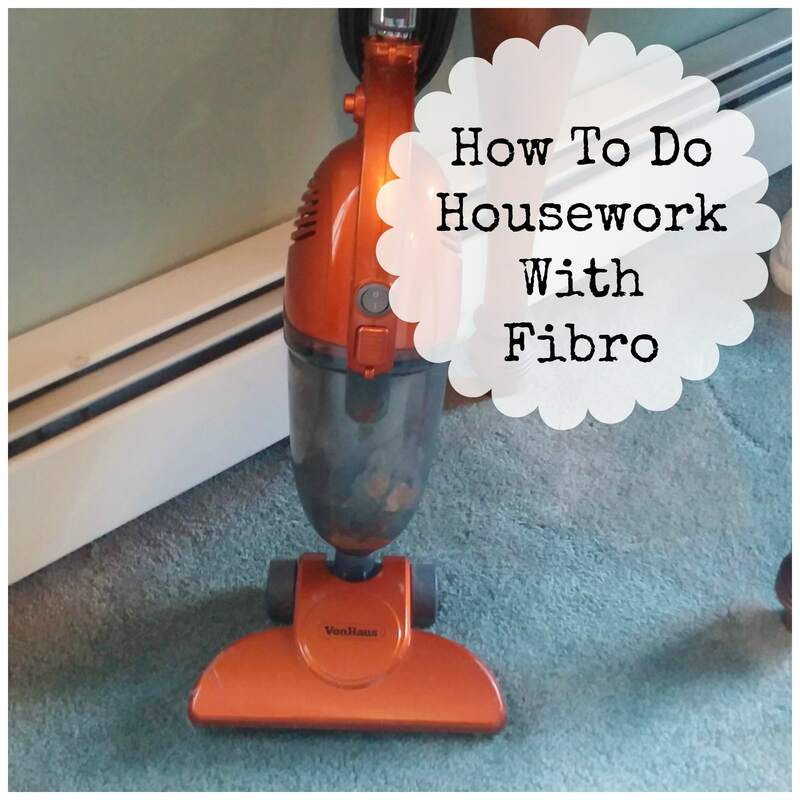 The best advice I can pass along for doing housework with fibromyalgia is not to sweat it, and not to expend too much mental energy fighting your condition, or being angry. With chronic illness, energy is precious. So I used what little energy I had to not stress, and to just concentrate on getting better. Despite what you hear from mainstream medical doctors, there’s hope for many people with fibro. However, they may not hear anything hopeful until they visit an alternative medical practitioner. Holistic minded doctors look at the entire person. They try to find the cause of your distress, instead of just throwing drugs at the problem. Because I knew a fair amount about alternative medicine (that I wasn’t putting into practice) when my disease hit, I knew there was hope. I never believed, even for a minute, that my condition couldn’t potentially be cured. At my sickest, the only way I could get anything done was to pace myself, and know my limits. As I began to recover (yes, it’s possible) I was even able to host a Christmas Eve party for my relatives. That’s not to say the cleaning didn’t knock me out. I wanted to lay down and take a nap right before the guests were due to arrive. But at least I was able to move around enough to clean. One thing that helped immensely was owning a stick style vacuum cleaner. The suction power is not as strong as my canister vacuum. However, the stick vac didn’t cause any additional pain or loss of energy. I bought my first stick vac when I was very sick. It lasted a good 7 or 8 years until it died. Then, last Christmas, my daughter bought me another stick vac. I absolutely love it and use it all the time, even though I’m feeling better. It’s lightweight and works better than the stick vac for getting into corners and hard to reach places. Anyway, if you can’t find a good stick vacuum locally, you can see the one I use just below, available online. Many commercial cleaning products contain an assortment of nasty chemicals. These are toxins. Toxins can cause inflammation. Inflammation causes pain. That’s why I use only plant-based cleaning products. I either make my own with essential oils. This is really easy to do. If you own essential oils, you can add lemon, orange, peppermint or lavender oils to your DIY cleaning solutions. Essential oils smell great and they pack an extra cleaning punch. For cleaning, you definitely don’t have to buy a top-of-the-line multilevel marketing brand. Excellent products can be had without going through a multilevel marketing distributor. I prefer to use Now brand peppermint essential oil for cleaning projects. It comes in a nice big bottle and it’s inexpensive. I also found a ready-to-use natural cleaning solutions brand that works great. It’s called Ecos and it cleans with the power of plants. Below you can see Ecos All Purpose Cleaner and Ecos Floor Cleaner. Thank you for sharing. A fibro warrior myself, I greatly appreciate any information I can find. Thank you for reading. Feel free to join my Facebook group. The details are in the Contact section on the home page. I brought a Bissel Crosswave mop and vacuum to clean my hardwood floors. I love it! I have back issues besides Fibromyalgia, so I try to have things that doesn’t require bending down! I also brought a cat litter box that cleans itself, ( Litter Mate). These two items have helped my pain from bending a lot. I have others items to help ease the pain on really bad days, too many to list, but also they customized to my needs. I know. Simple adjustments can make life so much easier.